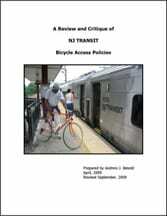 About a dozen bicycles were stolen from the Princeton Junction train station last summer. That’s a small fraction of the 100 or more bikes locked there every day, but still very frustrating for the victims. Use a good lock. Or two. Even the most expensive lock can’t guarantee that your bike won’t be stolen, but thieves prefer easier targets and are less likely to have two types of tools to tackle two types of locks. Cable locks are easier to cut. Combination locks are easy to open. Talk to a local bicycle shop about the different options. Lock your front and rear wheels. Make sure your U-lock is on tight and that the space within it is filled with your frame, spokes and security post, leaving no room for a bottle jack to get in and break it. Think about where you lock your bike. A thief can lift your locked bike over a short pole. 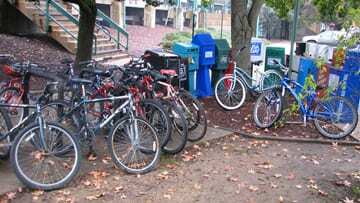 Use bike racks! Remember to register your bike online with the West Windsor Police Department. If it is stolen, having the serial number on file makes identification easier if it is recovered. Six bicycle racks were provided to the Caspersen Rowing Center at Lake Mercer by the WWBPA, and Carr & Duff Contractors donated the labor and materials to install the racks next to the boathouse. The Caspersen Rowing Center is the mid-Atlantic states’ only official U.S. Olympic Training Site and is located on the north side of Lake Mercer in Mercer County Park. Click to read more. The WWBPA and its partners (Greater Mercer Transportation Management Association, West Windsor Parking Authority and West Windsor BikeFest) marked the addition of more that 40 additional bicycle parking spots with bicycle racks and lockers at the Princeton Junction train station with a ribbon-cutting ceremony during National Bike to Work Week, May 2010.